Sammy-C21 V1.0 is a versatile and very compact/small (just 18x38mm size!) microcontroller board with the SAMC21G18A microcontroller, CP2102 USB UART converter and two CAN2.0/CAN-FD standard compatible CAN bus transceiver. All relevant controller signals are available on pin headers. 16MHz XTAL and 32768Hz TOSC watch crystal are included. The Atmel/Microchip SAM C series of 5V Cortex M0+ devices is designed for industrial and commercial applications in noisy environments. These products feature robust communications peripherals including the SERCOM module and CAN-FD, along with advanced motor control peripherals, and the Peripheral Touch Control (PTC) for developing robust user interfaces. 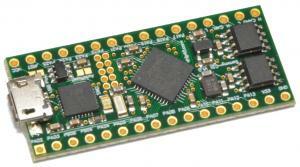 New: The Sammy-C21 can be ordered with preloaded chip45bootSAM Bootloader. With the free chip45bootSAM Windows GUI the application (hex file) can be uploaded through USB. No additional programming tool is necessary.